Migori senator Wilfred Machage has added more fire under Cord leader Raila Odinga’s ODM party after threatening to lead the Kuria community out of the ODM party. This comes only days after he skipped Friday rally graced by Cord leader Raila Odinga at Migori county stadium for homecoming rally for Suna East MP Junet Mohammed. “The Luhya and Kisii tribes are leaving ODM. Soon we in Kuria will leave too, if the Luos don’t want our votes then so be it, we will give it to other people who need it,” he said. 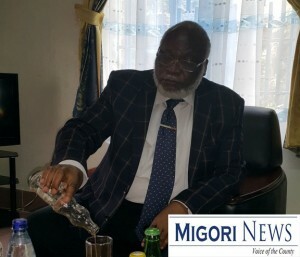 In an exclusive interview with Migori News, Machage revealed that he skipped the rally because he was going to be booed off insisting the Kuria community which is a minority is sidelined. “I promised myself never to attend any meetings in Migori, why should I when I will be booed?,” he said. Machage said ODM leaders from Kuria find it difficult to seek presidential votes because the majority Luos are treating them with disdain despite giving the party 23,000 votes. “They should have used this to make more inroads in Kuria but instead they have resorted to attack us. Luos should thank me for once for bringing them over 23,000 votes,” he said. Machage’s calls will bring image of infamous negotiated democracy which was pushed by Cord leader Raila Odinga for Kuria bloc vote which escaped him. The Luos in Migori have been feeling like a minority after senator, women representative and deputy governor post went to the Kuria community despite Raila being denied presidential vote.